The Vineyard has changed a lot since 1975. The landscape, the people and the place have all changed. But if there is one constant in a sea of change for the past 36 years, surely it is William Wilcox. He was the face of the county extension service for so many years people stopped counting, there at the ready to help Vineyard farmers with their crops, their soil and their pests. And for many more years he has been the water quality resource planner for the Martha’s Vineyard Commission. But now even the constant is due for change: Mr. Wilcox, who is 62, will retire from the commission at the end of this month. 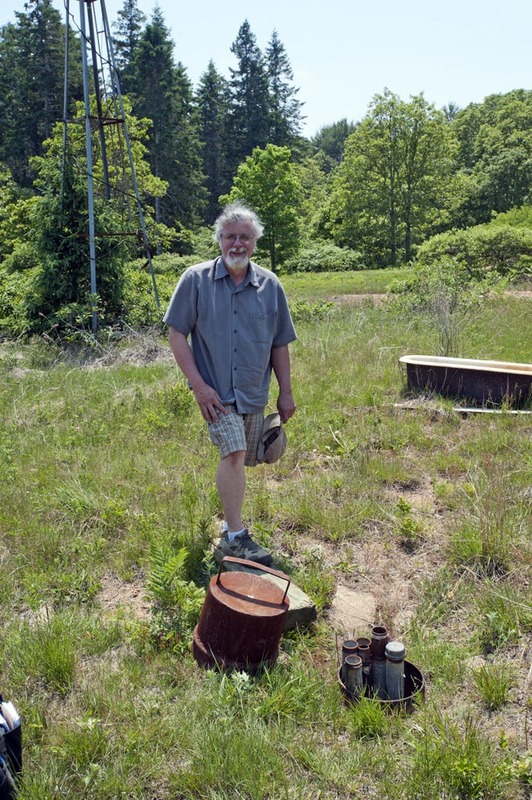 He has worked at the commission for 24 years, collecting data to evaluate development plans, measuring the depth of groundwater in the middle of the Manuel F. Correllus State Forest with a 500-foot tape, going out in the cold rain in Tom Osmer’s leaky boat in the Tisbury Great Pond to collect water samples. You name it, if it has to do with water, Bill Wilcox has probably done it. He has seen many changes at the commission through the years as well. In the 1970s and 1980s when developers were knocking on the door, wanting to carve up the Vineyard for profit, the commission was the gatekeeper, and Mr. Wilcox remembers the pressure and the extraordinary group of people who held the line. “They were out there on the limb, doing cutting edge stuff. Those commissioners did a lot. They changed the face of the Vineyard,” he said in an interview last week. “This Island would be a very different place were it not for the decisions made back then. Those rules and regulations led to a lot of bad feelings. There were a lot of districts of critical planning concern (DCPCs) and developments of regional impact (DRIs). There were moratoriums and hardship. But out of it, the changes were good for the Vineyard. Otherwise we would have been overrun with development,” he said. Examples abound: Farm Neck could have been more than 300 house lots; instead it is a golf course. Mr. Wilcox worked at the commission from 1975 to 1978, and from 1990 to now. He worked at the now-defunct extension service from 1978 to 1990. His work has always been with people, and he credits the late Michael Wild, one of the early executive directors of the MVC, for cultivating a philosophy of trying to help people make decisions. “His mantra was always ask the question: What can we do to help? What can we do to make the town board’s job easier, and all of us benefit from the process?” Mr. Wilcox recalled. But when it came to decision making, Mr. Wilcox always felt his role was to step back. “I sort of believe in the line that you can lead a horse to water, but you can’t make him drink,” he said. “The goal is to provide people with the information as best you can, as best you understand it, and what the options are, and then it is up to the town boards or the town voters to try to decide what is right,” he said. That philosophy has informed his work, whether at the county extension service, where he provided information for farmers, or at the commission, where as a member of the staff he provided information to commissioners. “It is about coming to the table,” he said. Mr. Wilcox grew up in Edgartown. His father was the veterinarian at the Foote Memorial MSPCA, the animal shelter and clinic that served both the Vineyard and Nantucket. He recalled fondly a time in the 1950s when he was eight or nine and helped his father and Sonny Jackson with the difficult delivery of a calf at Sweetened Water Farm. He left the Island for college, majored in geology and in 1973 got a master’s degree from Columbia University in the same subject. Dr. Wilcox died in 1990. Mr. Wilcox’s mother, Ruth, is 99 and lives in Oak Bluffs, not far from where Mr. Wilcox works at the commission office on New York avenue. He lives in West Tisbury with his wife, Shirley, an avid fiddle player. They will observe their 35th wedding anniversary on June 19. They have two grown daughters. He likes to sail, tend his vegetable garden and take long walks on the beach to clear his head. But the focus of his work at the commission has been exclusively water — surface water, groundwater, the quality of it, the biology of it, the protection of it as a resource on an Island that is a sole-source aquifer. When Mr. Wilcox began at the commission there was little data about the Island’s water supply. The water was clean, of course, and most people drew their drinking water from private wells — as they still do today for the most part, except in the three down-Island towns. But there were threats, some of them unseen. A sewage treatment plant had been built in Edgartown. Its purpose was to treat wastewater from downtown to protect the Edgartown harbor from pollution. No one knew at the time that the treatment plant would infect the groundwater around the plant with a plume of nitrogen that would eventually make its way toward the Edgartown Great Pond, a body of water even more fragile than the Edgartown harbor. “The changes in water quality are usually so subtle,” Mr. Wilcox said. “It is a progressive problem that takes decades to begin to manifest. People have forgotten how good it was. Shellfishermen know how good it was. They’ve been at it for 30 to 40 years. Unless you are working with the water you don’t see the slow, subtle, progressive change. It is hard to get your arms around what the issues are. There are a lot of people who think what is now is natural,” he said. Today, owing largely to the work of Mr. Wilcox and also technology, the commission has sophisticated maps of the watershed that can be used to track pollutants and other materials through the groundwater with great precision. Mr. Wilcox left the commission for 12 years, and when he returned in the 1990s much had changed in the study of hydrology. Self-effacing by nature, Mr. Wilcox is quick to praise the work of others around him. He credits the Massachusetts Estuaries Program for giving planners the tools necessary to project into the future to analyze the impacts of development, nitrogen and other factors on the ponds. He singles out the Friends of Sengekontacket, the Tisbury Waterways Inc., the Lagoon Pond Association, Great Pond Foundation and others for their good work in advancing the goals of water quality protection. Years ago, the Lagoon Pond Association was a summer cocktail party organization. Today it is in the forefront of spreading information to homeowners. “Advocacy organizations, their boards, are probably the most important thing,” Mr. Wilcox said. He said five years ago he almost threw in the towel. “It was just getting out of hand,” he recalled. “I was sampling five or six coastal ponds, it could have been eight or nine, every other week for two months. At the same time we were doing a whole load of DRIs, and each one of them had some water issue.” But like many hard-working Islanders, he found a healthy antidote for the stress. His last day at the commission is Thursday, June 30. A retirement party is in the early stages of being planned for Saturday, July 9, at the Agricultural Society Hall in West Tisbury. Congrats on your retirement and THANK YOU for all you have done for the Island.